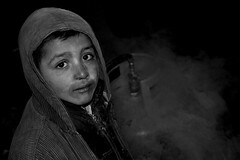 This entry was posted on Tuesday, January 22nd, 2008 at 12:25 am and is filed under Afghanistan, Aid Effectiveness, Corruption, From Afghanistan with Love (photos), Human Rights, People, Reconstruction. You can follow any responses to this entry through the RSS 2.0 feed. You can leave a response, or trackback from your own site. I’ve been eagerly awaiting your return and this post totally makes my wait worth the while. A wonderful piece (and I’m gonna suggest you push the piece around for publication). A side note, Virginia Quarterly Review just did an issue featuring some articles from Iraq and Afghanistan. If you manage to find a literary hipster western bookshop in Kabul, I suggest you pick up a copy…and maybe even submit this piece to them. Nix the maybe. Send it. Hope all is well and safe. Here’s to praying for mercy from the grips of winter. thank you Q. for the wait, the idea of me pushing this for publication -though in that case it may have to be cleaned up a bit, both editorially and substantively, in that i realize i have been unduly harsh on some groups. and for the heads up about VQR -i hope i find it here. i see the heart and hedonism stuff has piqued your interest. i will send you the link. What a pleasant surprise to see you back. And this is a very remarkable way to come back. Such a reminder of real life back home really sobers. Especially in a city (moved to DC since January) where rhetoric and prose around Afghanistan is mostly abstract, wrapped in big words, out of bigger mouths, and all habitually for its own sake. I hope you are well, and hanging in there when it seems to be getting harder and harder every other day. I am almost tempted to not study for my exam tomorrow and read through your blog for the rest of the day. blog and in accession capital to say that I acquire actually loved account your blog posts. Welcome to Safrang, a blog about Afghanistan and the inexorable march of history. For more see About.